Fort Worth-Dallas, Texas, September 19, 1919. London, September 9. — (By I. J. P. B.) Ten thousand Jews among them Jewish deputies of the Polish Parliment, representatives of all synagogues and Jewish organizations, members of the American Food Commission at Warsaw, and Jewish soldiers took part in the elaborate and impressive ceremony in connection with the funeral of the Jewish writer and charitable worker, Jacob Dinezohn, who died last week in Warsaw. The funeral of the beloved “Father of the war-orphans” was one of the greatest mourning demonstrations which Warsaw has ever seen. Policemen and five hundred special officers were assigned by the authorities to keep order and to see that traffic in the streets did not interfere with the funeral procession. Among the pallbearers were the Jewish writers, Z. Prilutski, Hillel Zeitlin, and S. Anski. Practically all Warsaw Jewry was present at the mourning services in the cemetery. 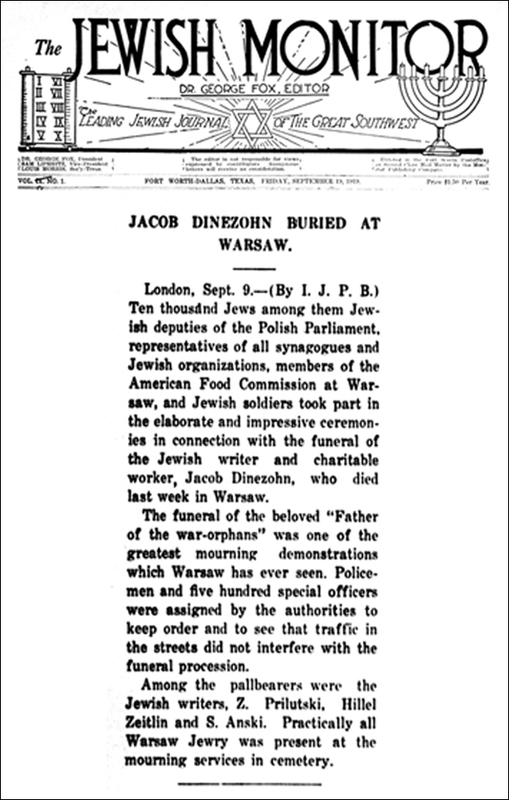 Jacob Dinezohn, whose name has become a household word in Warsaw because of his efforts in behalf of Jewish children orphaned during the war, died on September 2nd, at the age of sixty-three. Although well known as a writer, his social service work has especially endeared him to his co-religionists. The modern schools for Jewish children founded by him, the homes for children, and the large number of orphans whom he personally provided for, are an enduring monument to his unselfish and whole-hearted interest in his people. Warsaw, September 2. — Jacob Dinezohn, who has been called the “Father of the Jewish realistic romance,” and whose name has become a household word on account of his untiring and effective work in behalf of the thousands of Jewish children who have been orphaned during the war, died Tuesday morning in Warsaw, at the age of sixty-three. Dinezohn was born in Zager, Kovna, Subernye, in 1856. He was educated at Mohliv-am-Dnieper, in the home of an uncle, Issac Eliasoff, who was something of a mathematician. Dinezohn gave much of his time to the study of Hebrew, and later became tutor of Hebrew in the household of the Burwitch family in Mohliv. It was here that Dinezohn became aquainted with German and Russian literature. Hebrew was the first literary medium which Dinezohn used, but after publishing a few letters and articles in that language, desire to reach the great masses of the Jewish people who did not understand Hebrew caused him to turn to Yiddish instead. After a series of scientific nature studies, Dinezon’s first realistic romance appeared. This was followed in 1877 by “The Dark Young Man,” a romance whose success was large and immediate, the book running into several editions. In his works, he is above all a moral critic, aiming always to arouse the best in his readers, and to instill love and sympathy for the weak. But even if Dinezohn had made no noteworthy contribution to Yiddish letters, his services in behalf of suffering humanity would have endeared him to the Jewish people. The fame of his work for the war orphans of Poland has gone far. Dinezohn’s schools, Dinezohn’s home for children, Dinezohn’s little orphaned wards come to mind whenever his name is mentioned. He will long be remembered as a rare and great soul. A Warsaw a despatch informs us of the death of Jacob Dinesohn, one of the earliest and most popular writers—in his day—in Yiddish. The Modern Yiddish, as well as the Modern Hebrew, literature, is yet young, and as such, it is yet difficult to measure the milestones of its progress with the accuracy inherent in more venerable literatures. Its development has been too rapid and quite abnormal, the span of life of one generation of writers has practically seen its birth, growth, and development to what it is today, thanks to the labors of the devoted band of which Dinesohn was a conspicuous member. The critics of the present day may smile indulgently at the early efforts of Dinesohn, just as he smiles at the equally-well-meant efforts of his contemporaries. These writings reflected the needs of an unsophisticated, as well as an uncultivated, reading-public, whose mental pabulum could not reach out beyond the raw, villainous and thorough-going depravity of the characters created then by the writers in Yiddish. These had to possess the very essence of villainy, had to make the reader shudder with fright, and shed buckets of tears, as well as shower heaps of curses upon their guilty heads, while their victim—the persecuted, and the virtuous and the innocent—had to embody within him all the virtues in their primal form, to be as pure as the fresh-driven snow upon the mountain-top. These early readers, in their utter unsophistication, as well as their oblivious innocence of the ways of the world, did not know, poor things, that life was a chemical compound of Virtue as well as Evil, that, that which differentiated the good man from the evil-doer, was not an organic entity, but, rather, the measure and proportion of the different ingredients that went into the composition of that inner being, usually denominated as character. They did shutter deeply and sincerely, and rained heaps of curses upon the depraved head of the “Schwartzen Yungermantschik,” who, like a hound, would keep upon the bloody track of his victims, shed bitter tears at the fate of the hapless, “Hersheles” and “Yosseles” and kindred white-robed, angelic victims of rascality, gnashing their teeth at the consummate villainy of their persecutors. 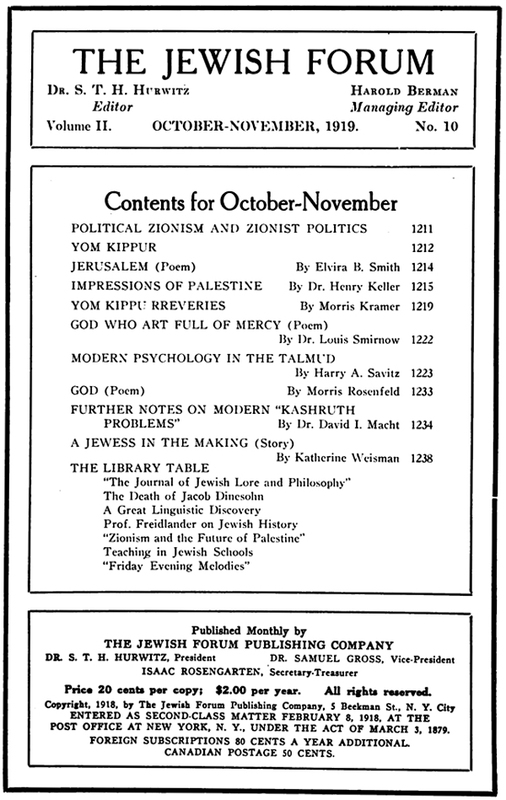 It is characteristic of the man and his instinctive reading of the signs of the times, that, when the Yiddish literature had progressed to a higher stage of development, and beyond his Metier, when it really did begin to assume the aspect of a real, and modern literature, to reflect the life and the thoughts of real people and voice the aspirations of the great masses of the Jewish people, Dinesohn’s pen was laid away to rest. For, barring the composition of a few brief sketches and a few pamphlets on timely topics, Dinesohn wrote nothing during many a year of his later life. Did he realize that a new age has need of new singers, singers who will perceive the new notes that thrill and stir in the new heavens, and that the meat of youth and immaturity may be the poison of an adult, and riper, age? Perhaps he did sense it, with that subtle clairvoyance of his, which enabled him, to detect promise of talent, and even genius, in the production of raw youth, (he was the discoverer of Perez and other shining stars in our literary firmament) the coming of other times and other songs. There, unfortunately, are some artists who, like Rip Van Winkle, remain asleep for dozens of years, and then, shout themselves hoarse proclaiming from the house-tops their loyalty to a king who has been dethroned decades previously! But, the wiser man escapes their fate. What a fetling dénouement to the career of the creator of “Hershele, and Yossele,” the embodiment of the pitiful and the persecuted, to end his days in deeds of charity, and the founding of homes for the thousands of the helpless orphans of the terrible war! A Christian writer disgusted with life’s scars will sometime turn his face upon it, and join a community of mendicant monks and spend his days in prayer and fasting, while the Jew will usually turn to works of benevolence and practical good deeds, the Jewish Metier.